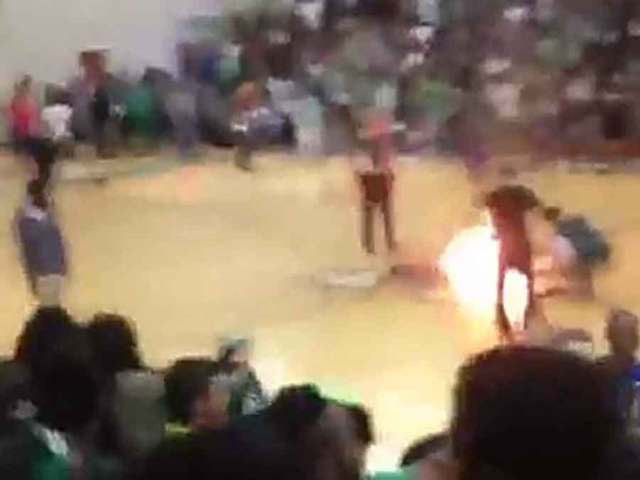 A "fire-breathing" performer is recovering after he caught fire Thursday during a routine at a Florida high school. Ricky Charles, 50, spoke to the media on Friday from the hospital where he was taken after the accident. "This is just me falling down. I got to get up. You can't stop me from doing it again," said Charles. Doctors said he suffered burns to his face, leg and arm. Charles' company, "Inferno Challenge," was hired by Atlantic High School to perform during a pep rally Thursday morning. Charles said he's been doing his routine for more than 30 years, but on Thursday he used a new lamp oil to help fuel the fire. "Today I changed the oil, but I never practiced with it. So, I was just going to do it because it's flammable. No big deal," Charles said. Moments after his routine started, the performer's body was covered in fire. "So, when I did my blast with this new oil, the flame trickled right back down to my face. It caught my face on fire, which is a new thing to me. And that's when everything just went crazy. I was trying to put the fire out on my face with my left hand, and I still have the bottle with oil in my right hand. 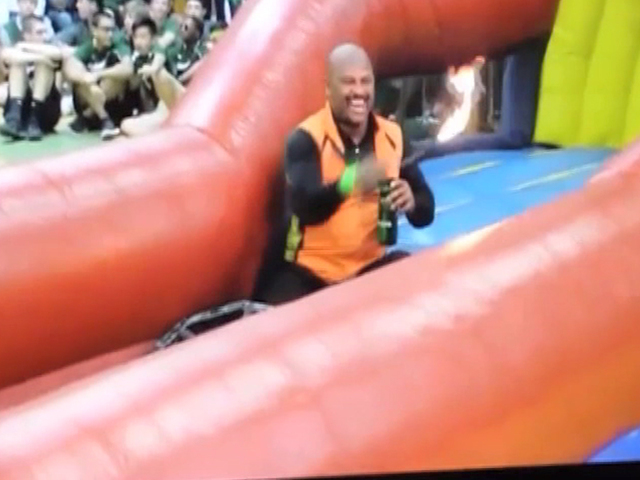 So while I'm doing that, the oil on my right hand spilled on my pants, so now my pants are on fire," Charles said. Quickly after he was covered in flames, his crew and people at the school put the fire out with extinguishers. "Thirty seconds seemed like two minutes," Charles said. Seven students were also transported to local hospitals. At least one student was transported due to smoke inhalation.